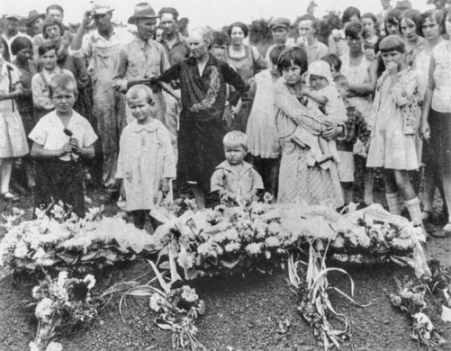 Gastonia Strike, the most notorious textile labor struggle in North Carolina history, occurred in Gastonia in the spring, summer, and early fall of 1929. As in other mill communities of the textile manufacturing region, conditions for confrontation had been ripe in Gastonia throughout the 1920s. The Loray Mill was particularly vulnerable for two reasons: first, with more than 2,000 workers, it was by far the largest single mill in the state; and second, it was owned by a prominent northern company, Manville-Jencks of Providence, R.I. In 1927 the company had hired an engineering firm to study ways to reduce labor costs and maintain production levels. The report by the Barnes Textile Service led to a reduction of the workforce at the Loray Mill from 3,500 to 2,200 by the end of 1928. Another factor contributing to the ultimate showdown was the decision of the communist-led National Textile Workers Union to target the mill for a southern organizing drive in the spring of 1929. On 1 April, within a few weeks of the arrival of union organizers, Loray workers walked off the job. At first the strike enjoyed nearly total participation, but by the end of April many laborers had drifted back to work or the mill had hired replacements. The goals of the strike-a minimum weekly wage of $20, equal pay for women and children, elimination of the stretch-out system (assigning more tasks to fewer workers), and union recognition-were compelling. However, the union persisted in disseminating ideological dogma that alienated and confused some employees. Emphasis on biracial strike committees (despite the small number of black workers at the mill) in the face of strong cultural barriers to racial integration in the state also weakened support for the union. The union's effort to maintain a headquarters and a tent colony for striking workers who had been removed from their homes by the company became a source of friction with local authorities and a symbol of resistance even after the strike ended. On 7 June violence erupted when Gastonia police confronted guards at the tent colony. The ensuing struggle led to gunfire from both sides, leaving one worker and four police officers wounded. One officer, police chief O. F. Aderholt, died of his injuries the next day. That summer the community turned its attention to the trial of Aderholt's alleged killers-Fred Beal, a union organizer, and 14 strike leaders. Because of the emotion generated by the case, the presiding judge moved the trial to Charlotte. Nevertheless, Gastonians were riveted on the courtroom proceedings; many hoped for a guilty verdict, which would expel the communists and restore stability to their community. But on 9 Sept. 1929, after the mental breakdown of one of the jurors, the judge declared a mistrial. The community reacted bitterly. Caravans of vigilantes roamed through the mill district of Gastonia harassing former strikers and union supporters. Attempting to regain the initiative for their union campaign, communist leaders called for a mass rally of all textile workers on 14 September. Gastonia police, managers and "loyal employees" from local mills, and deputized citizens tried to stop the rally. They intercepted carloads of workers and sent them away. While pursuing one truck containing strike leaders, they opened fire when the riders attempted to escape. One worker, Ella May Wiggins, was shot and killed. Wiggins, the mother of five children, had been a composer of ballads and a major inspiration during the organizing drive of 1929. Her death caused another wave of violence in Gastonia, and for several days union supporters were beaten and union property was dynamited. By the end of September the communist-led union had abandoned its organizing drive, dismantled its headquarters in Gastonia, and relocated its membership. Five men accused of murdering Wiggins stood trial but were not convicted. The second trial in the Aderholt murder case did produce a conviction of Fred Beal and seven codefendants. The defeat of the textile unions in Gastonia and other southern towns reaffirmed the authority of the mill owners. To accomplish this victory, the manufacturers needed and received considerable assistance from state and local law enforcement agencies, along with the persuasive and moral power of the local press and religious leadership. For the mill workers, the clash with management was an exhilarating but, in the end, bitter experience. The revolt of these laborers had failed to win concessions from the new order imposed by the industry's high-speed machinery and scientific management. The dramatic struggle between labor and management in Gastonia ended quickly, but not before the sprawling community had become a national and international symbol for the ailing textile industry in the South. Coverage of the strike, the violence, and the trials was extensive in national newspapers and periodicals. The strike and related legal actions drew the attention of prominent writers such as Sherwood Anderson, John Dos Passos, and Sinclair Lewis. Six novels were published in the 1930s using Gastonia as the backdrop. The Communist Party exploited the tragedies for partisan advantage and, even years later, contributed to the "Gastonia myth." Many Gastonia citizens, for whom the events of 1929 evoke painful memories, have been eager to forget the strike. Liston Pope, Millhands and Preachers: A Study of Gastonia (1942). John A. Salmond, Gastonia, 1929: The Story of the Loray Mill Strike (1995). You write, the Communist Party had exploited the events of Gastonia to their advantage. Why not other parties have supported the strikers and used to their advantage? I visited Gastonia in 1972, as a member of the Communist Party USA. Seeking signatures on a petition, I had an opportunity to speak with a number of citizens. Here are interesting reactions from two of them, which I quote as nearly verbatim as possible. One said that her grandfather had told her that she shouldn't believe anything "bad" that she heard about the Communists, as "they were the only people who helped us." Another party simply said, "Why did it take you so long to come back?" The latter is up to your interpretation. We collected a fair number of signatures, from whites and blacks, on our petition to allow the CPUSA to be on the election ballot.